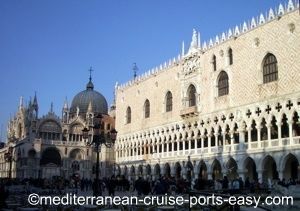 As you look at the Doge's Palace in Venice from the outside, it might look a bit smallish to you. Especially if you compare this one to other palaces you might have seen in your history as a Europe cruiser. 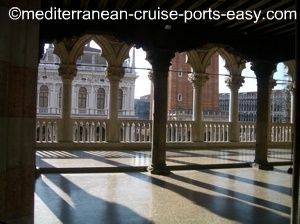 If you didn’t think there is much to see in the Doge's Palace, then you’ll be pleasantly surprised. Here is a very brief listing of the highlights you can expect inside the Doge's Palace in Venice, Italy. Of course, as a Mediterranean cruiser with limited time, you might not have a chance to see them all. So you might like to just skim through these and see what catches your interest. Next, get a good guidebook and head for the sights you think you will enjoy most. 2. Courtyard – The courtyard of the Doge's Palace in Venice is considered a Renaissance masterpiece, inside it you will see the grandiose staircase or Scala dei Giganti. 3. Scala dei Giganti or the “Staircase of Giants” - This staircase leads to the State apartments on the 1st floor of the Doge's Palace in Venice. This staircase got its name from the two large figures of Mars and Neptune, which symbolized Venice’s power on land and sea. Right here at the top of the stairs, in between these two statues is where the Doge would wait to receive other dignitaries. This is also where many a Doge was crowned. 4. Appartamenti Ducale (Doge’s Apartments) – this is where the Doge and his family actually lived. There’ s not much furniture to be seen here as every Doge was expected to bring his own. 5. Cortile dei Senatori – is found to the left of the courtyard of the Doge's Palace in Venice, and has beautiful marble decoration. 6. 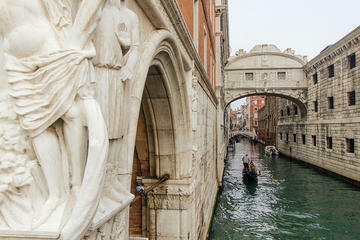 Ponte dei Sospiri (Bridge of Sighs) – is an enclosed bridge over Rio di Palazzo joining the palace with the prison. 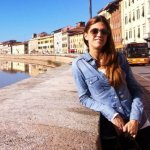 Normally accessible only by booking a Secret Itineraries tour, which you can do here. 7. Scala d’Oro (Golden Door) – these staircases of the Doge's Palace in Venice lead from the Loggia on the 1st floor up to the 2nd floor, and onwards to the offices on the 3rd floor. This staircase got its name from its 24 karat gold decoration and it was designed to impress visitors. 8. 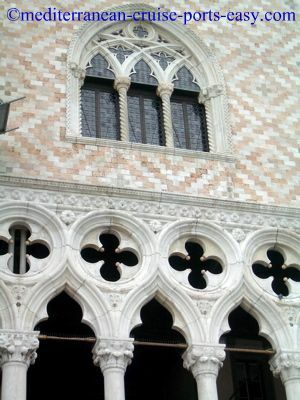 Porta della Carta – the “Paper Gate” is the main entrance, and is a link between the Doge's Palace in Venice and the Basilica. 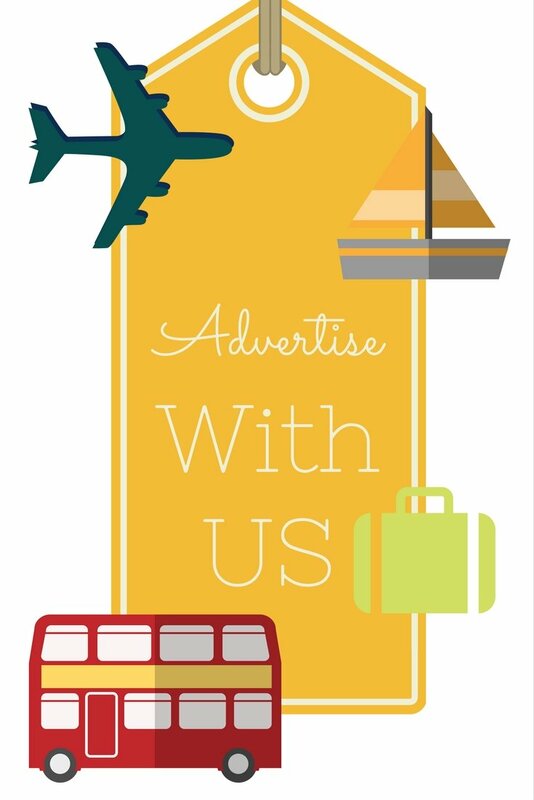 Pay special attention to the door, which is surrounded by intricate decorations and figures. 9. Atrio Quadrato (Square Room) – contains some remarkable paintings by Tintoretto. 10. Museo dell’Opera – is on the ground floor and displays original façade statues and decorations as well as column capitals of the Doge's Palace in Venice. In the 19th Ct. they were found too dilapidated so they were removed and replaced by copies. After careful restoration, these originals can be seen in Museo dell’ Opera. 11. Armory – the Armory rooms of the Doge's Palace hold an impressive display of over two thousand suits of armor and weapons. 12. Sala del Consiglio dei Dieci (Chamber of the Council of Ten) – is where the Council of Ten sat. They were in control over all aspects of Venetian life. See paintings by Veronese. 13. Sala del Collegio of the Doge's Palace in Venice – is where the government Cabinet met chaired by the Doge himself, and was also where very important visitors to Venice were received. Look out for the Doge’s throne and spectacular ceiling with paintings by Veronese. 14. Sala dei Tre Capi – this room was for the three Chief Magistrates that formed the Inquisition Court dealing with espionage and treason. You did not want to end up in this room with these three! 15. Sala del Maggiore Consiglio (Chamber of the Great Council) – is one of the largest rooms in Europe. It’s so large because it had to accommodate up to 1500+ citizens that were entitled to vote during the Council sessions. Look out for the massive painting by Tintoretto, entitled “Paradise”, above the Doge’s throne. It’s the largest oil painting in the world! 16. Sala della Bussola (The Compass Room) – this room is named after the wooden compass found in its right-hand corner. People waited here to be summoned by the Council of Ten. Look out for the “lion’s mouth” next to the door where secret and personal disapprovals could be dropped. 17. Sala delle Quattro Porte (Room of the Four Doors) – this was the formal antechamber where, as a visitor, you would be directed towards the courts, the Doge, or wherever else you wanted to go. Note the paintings by Titian and Tiepolo, and the ceiling by Tintoretto. 18. Sala dell’Anticollegio – this room was mostly used as a kind of “waiting-room” for foreign delegates wanting to see the Doge. The walls are adorned by paintings by Veronese and Tintoretto. 19. Sala del Senato (Senate Chamber) of the Doge’s Palace Venice – is where the Senate met together with the Doge, the Great Council and the Cabinet, and made decisions on policies, peace and war. Look up at the ceiling to see Tintoretto’s “Triumph of Venice”. 20. Sale dei Inquisition (Inquisition Chamber) of the Doge’s Palace in Venice – is where the Inquisitors met. Their task was interrogation. This room was originally entirely covered in leather… perhaps to hold in the excruciating screams coming from offenders of the state being interrogated and tortured! 21. Prisons – this is where mostly political prisoners were held. You definitely would not have wanted to end up in the basement, the so-called Pozzi or “wells”. Here you could hardly breath, it was damp, insects crawling around and terribly overcrowded. If you think your time is too limited to wander around by yourself but don't want to pay for one of the shore excursions sold on the ship, check the Skip the Line: Doge's Palace Tour by Viator or Skip the Line: Venice Walking Tour with Doge's Palace. PIAZZA SAN MARCO FOR CRUISERS.